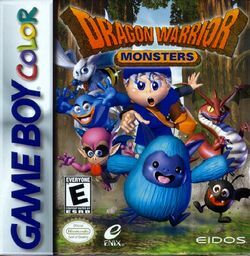 In Dragon Warrior Monsters, enter Terry's Wonderland, a magical place of kings, monsters and magic spells. Make monsters your allies to fight through the dangers that lie ahead in the long quest. Find your kidnapped sister and become the most powerful monster master in the world! Each monster has unique special skills to use in battle. Train and treat them well, and you'll be victorious! Over 40,000 different combinations - can you breed the rarest and most powerful monsters? Over 200 cute and cool monsters to collect, tame and train. Breed your trained monsters to make more powerful monsters, each received special skills from their parent monsters. Play solo, or connect two Game Boys together to battle and breed with your friends' monsters. A spin off of Japan's best selling RPG game, Enix's Dragon Quest. Please note this game is compatible with the Game Boy as well as the Game Boy Color. This page was last edited on 2 June 2012, at 02:06.